The Pork Chop Willie band is the duo of Bill Hammer on guitar and vocals and Melissa Tong on fiddle and vocals. The music is Mississippi hill country music. Horn-rimmed glassed Manhattan-ite Hammer and classically trained Tong look like an unlikely duo to have the chemistry and authentic chops to produce an album in the style of Junior Kimbrough and R.L. Burnside, but they have done it in a big way. The sound has that tribal, basic beat that makes the hill country music so real and visceral, and the playing and singing is spot on. Hammer wrote most of the cuts and ranges across the spectrum of hill country blues, Americana, country, rock, classical and more. From the dense, urban streets of Manhattan we get a new and fresh sounding Mississippi hill country CD! 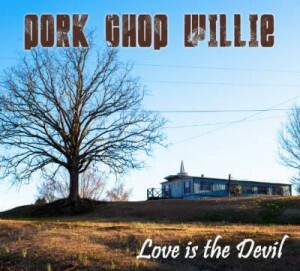 Six of the tracks were recorded in Mississippi and feature Kinney Kimbrough on drums, Eric Deaton on bass and guitar, and David Kimbrough on guitar. The other seven were done in NYC and have Robin Gould on drums, Tony Coniff on bass and backing vocals, and Steve Tarshis on guitar. At first I tried to think that the Mississippi tracks had a more down home sound, but then I realized I was listening to some NYC recorded tracks. Both sets have a nouveaux sounding 1960’s pop country tune and there is no real discerning one set from the other, a testament to all the players. The sound here is rich, vibrant and, at times, throbbing with the heart of soul of the hill country. Two R.L. Burnside songs grace the effort: “Snake Drive” and “Poor Boy” Junior Kimbrough’s “All Night Long” and the traditional “Crawdad Song” are the other covers. “Snake Drive” is swampy, gritty, dirty and just perfectly rendered. It even features a hissing snake sound on the last two verses and comes off really well. The guitar here is spectacular. “Poor Boy” is country fried and also done over well. The Kimbrough song uses one chord and goes on over 8 minutes, but it’s not boring. Tongs’ fiddle solo and her interplay here (and in other places, but much so here) is seminal. Hammer says he obsessed over “Crawdad” and we can glad he did; it bounces in a sweet, jumping Americana style and one could two step for hours to the great beat with swells of guitar, fiddle and vocals that overlay it. The songs I called “pop” tunes are “Rosalie” and “She’s Gone” where the hills go ‘60’s pop. “Rosalie” is just a simple progression yet it’s fun and cool. “She’s Gone” could be an English invasion song, but then the fiddle appears to drag us back to the USA. A neat cut about a relationship ending, except the song is a bit celebratory! On the darker side is one of my favorite originals: “Devil in My Soul.” Hammer wrote the lyrics in a sort of disjointed stream of consciousness and delivers some nice slide over the tribal beat. “Two Many Cuts” opens the album and is the opening cut and it grabs at the listener. He sings of how the emotional cuts from our arguments can accumulate to destroy a relationship. The fiddle here is really well done and introduces us to just how good Tong is. The rest of the cuts are equally good. I enjoyed the heck out of this CD and think you will, too. Fans of traditional blues and the new will find something here to savor! And best of all, the proceeds of the CD go to benefit musicians and music in the North Mississippi Hill Country!